National Volunteer Week Spotlight Day 4! Volunteering your time and expertise, even in the short-term, can help neighbors find long-term pathways to success. Yesterday Portland Arts & Technology High School (PATHS) held a workshop featuring a trivia game to help prepare students with job search skills. 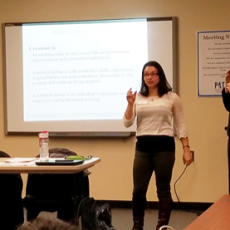 Volunteers from Goodwill’s Job Connection program led a class on resume writing and assisted one-on-one with resume writing and support. This is part of a PATH’s month-long focus on Career Readiness. Later this month, volunteers will conduct mock interviews and attend a career fair where they will use their new skills and resumes to apply and search for employment. Financial stability and employment are key strategies of Thrive2027 Goal 2; ensure that individuals and families have the education, employment opportunities, and resources to achieve financial stability. To learn more about volunteering your time and expertise and help our community thrive, visit volunteer.unitedwaygp.org.